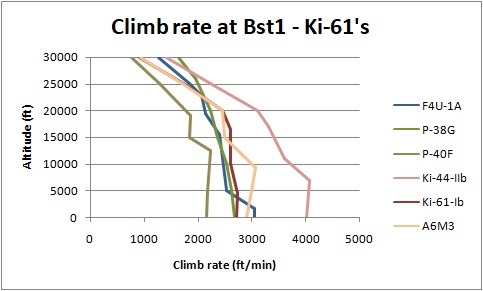 Full rehaul of the Ki-61-Ib and Ki-61-Ic flightmodels. See further down for details. 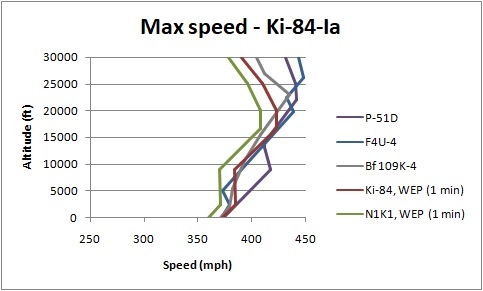 Full rehaul of the Ki-84-Ia flightmodel. See further down for details. Time increased before the oil tank goes empty when leaking oil, now on par with other radial engines. Flaps now also have a 20° setting. This to better represent the complex flaps mechanism of the Hellcat which had the flaps lower to varying angles, depending on the planes relative airspeed. Landing gear dragco has been reduced down to more logical numbers. The landing gear still causes much drag when extended and reduces acceleration in a dive, but no longer unrealistically so. This fix will make it easier to take off from carriers with heavier loads. When looking into the hitpoints setup for fighters in Warbirds it was quickly evident that they had been set quite arbitrary (note: understatement) for the various fighters by several different designers during the long life of this flight simulator. The lightly constructed A6M Zero could take the same amount of bullets as the huge P-47 Thunderbolt, a plane renown for it's ruggedness. Even fighters of the same series could have completely different hitpoint setups relative to each other. Firstly all hitmaps have been completely rebuilt based on blueprints and "x-ray" drawings of all the WW2 fighters in Warbirds. Now all hitpoints for all plane parts like the rudder, elevator, wings, engine, fuselage, stabilizers etc have been thoroughly recalculated based on the hitmap size of the parts, the materials the fighter was constructed of in real life, reported fragility/ruggedness, blueprints etc. A fighter with a radial engine will now be more durable to engine damage than an inline engine'd fighter. Laminated wooden parts are somewhat more durable to machinegun fire than metal/duraluminium ones. A larger plane will generally have more overall hitpoints than a smaller plane, although of course a larger plane is easier to hit due to it's size. A fuselage with an extra sturdy inner construction will be thougher than a really lightly constructed fuselage. Self sealing fuel tanks can now sustain more damage than non-self sealing fuel tanks etc etc. Hopefully this extensive work, that has been ongoing since before the summer of 2018, will now result in a more realistic relative damage modeling between the fighters than what Warbirds has ever seen. There are four beautiful new skins made by IArt7. 21 new improved pictures for when selecting terrains for Free Flight mode. Also made by IArt7. 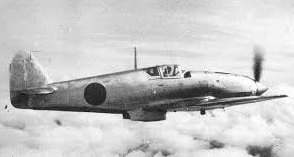 The Japanese Ki-61 made it's combat debut in early 1943 and was a leap in design compared to earlier Japanese fighters. It was nicknamed "Tony" by the Americans since it resembled an Italian plane, and it is indeed quite similar to the Macchi C.202 in appearance. This is partly due to the fact that the Ki-61 was also fielding a license built German DB 601Aa engine (Kawasaki Ha-40), the same engine as used by the Messerchmitt Bf 109E-4Aa and Macchi C.202. The problem is just that this engine was outdated by several years when the "Tony" arrived in 1943, and this fighter was as such quite underpowered compared to the US planes it was up against. Even worse the Japanese built their engine version lighter than the original, resulting in constant reliability problems. Being underpowered aside, the Ki-61 airframe is very well designed. This plane can outdive American fighters and also hold a tight turn radius. It is very maneuverable at slow speeds and is provided with armor plating behind the pilot, which wasn't very common in earlier Japanese fighters. Another good trait of the Flying Swallow is that it has quite good armament. In a fürball the "Tony" can do really well, but will have trouble against faster opponents of it's era if the enemy pilots keep their speed up. Armed with 4x 12.7 mm machine guns and weighing 6504 lb at full load. It's top speed is 363 mph at 20000 ft and it can bring 2x 250 kg bombs as well as use drop tanks. In all aspects similar to the earlier Ki-61 with the exception fielding 2x 20 mm cannons in the wings instead of 2x 12.7 mm machineguns. 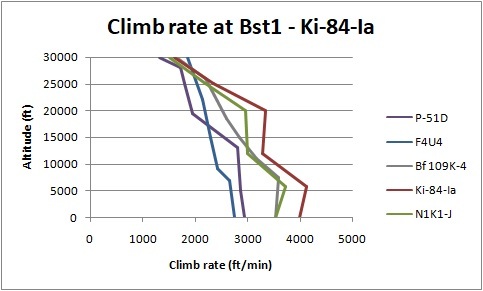 The Ki-61-Ic is only slightly heavier and can pack a good punch. Entering combat service in Aug 1944, the KI-84-Ia was a formidable fighter plane. Unfortunately for Japan their plane production was vastly inferior in numbers compared to the fighter production of the U.S.A., and the Ki-84 suffered constant maintanance problems in the harsh conditions of war, with especially the engine often experiencing reliability problems. When fully functional though, this fighter made a good account of itself even against the outnumbering odds the Japanese pilots faced. 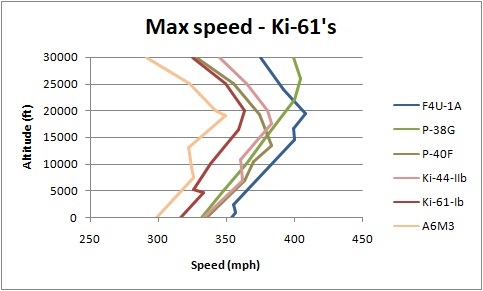 The top speed of the Ki-84 can match several of the fastest fighters of WW2, although the pilot needs to be careful of running the WEP for to long. It has good firepower with 2x 12.7 mm machineguns and 2x 20 mm cannons. The stall warning is good and the rudder and aileron controls are functional even at higher speeds. The elevator quickly gets heavy above 300 mph IAS though, requiring the pilot to use elevator trim to pull out of a high speed dive. 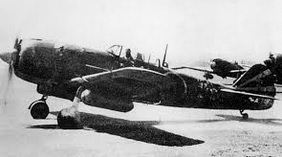 The "Hayate" can also engage enemy bombers, having a shielded windscreen protecting the pilot against machinegun rounds. What makes the "Frank" a great fighter is foremost the combination of a high top speed coupled with it's maneuverability and great sustained turning ability. High speed turns aren't it's best trait due to thin wings and a low max AoA. 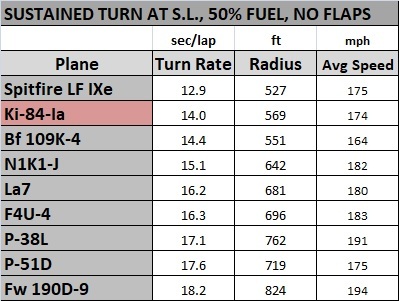 In slower sustained turns though it can easily outturn American late war fighters, and the Ki-84 is fairly on par with a Spitfire XIVe in turn rate. Overall this is a very well designed fighter that can competete with the cream of crop. 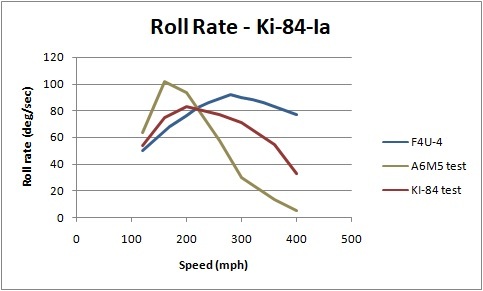 Pilots facing the Ki-84 can engage it in high speed turns, but should often be vary of getting tangled in, depending on their own ride. For fast fighters that can't turn with the Ki-84 the key is patience and surviving when extending away from it, as the "Frank's" engine will quickly overheat when running at WEP, allowing one to eventually create distance. Fighters with great diving performance can also outdive the Ki-84. Against most late war opponents the Ki-84-Ia pilot should try to make it a climbing turn fight, but can also resort to boom n zoom energy tactics depending on the foe. All in all the Nakajima engineers produced a great fighter, but Japan had to few of the "Hayates" to make an impact on the outcome of the Pacific war. Last edited by Robert on Wed Nov 28, 2018 8:26 am, edited 9 times in total. Japan’s most famous and feared fighter aircraft, the Zero ran rings around other fighters in the early days of World War 2. Depicted is Hirotoshi Nishizawa, Imperial Japanese Navy’s ‘Ace of Aces’, with a reputed ‘kill’ total of over 100 enemy aircraft. This looks like a really good update! 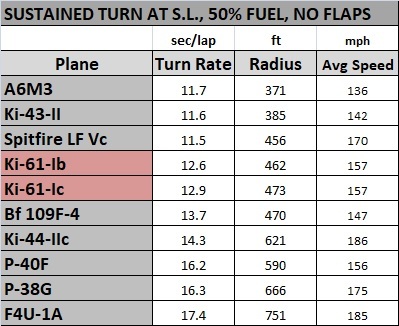 The numbers you have for turn rate agree with my quick study of relative wing and power loadings very well! This is going to add some fun to the game- more competitive matchups will always equal more fun to me, and when the data are in agreement with our models, so much the better! Thank you sir . What method are you using for calculating turn rate? Would be interesting to check the FM's vs this calculated performance. Also a fix for the F4U Corsairs has now been added to the update, reducing the landing gear drag to more realistic levels. Prime gave me a heads up about problems accelerating enough when taking off from a CV, after checking the files I found that a small parameter concerning the landing gear dragco was set to high. While still a daunting task, requiring flaps and some skill to take off a heavy Corsair with bombs and rockets from a CV, it should be more doable with this fix. 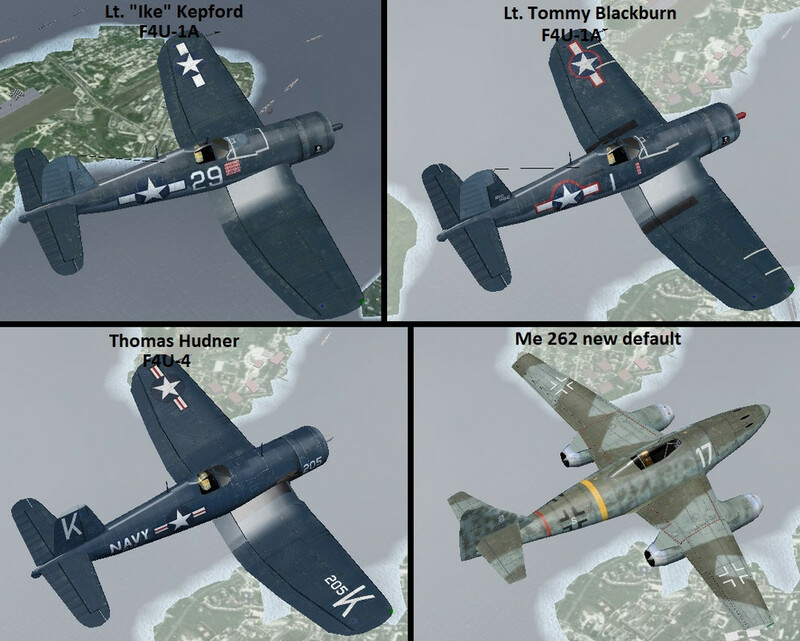 Hopefully we can also include Iarts new F4U skins if they get finished this weekend. Added to the update: Completely new skins by IArt. The update is hopefully to be released during the coming week. Also added to the update: 21 new improved pictures for when selecting terrains for Free Flight mode, created by IArt7. Last edited by Robert on Mon Nov 26, 2018 6:49 pm, edited 1 time in total. thanks!.... nice skins iArt. Nice job Robert! And the update is now available for download! Curious as to how you guys decided just how many 'hits' each type of airframe could withstand before it blows as well as how you calculated the impacts of canons v mg's?. Glad to see it done tho! Any plans to do same for bombers?